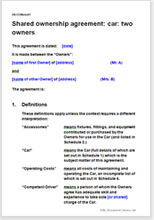 This agreement covers any situation where two parties share the ownership and use of any kind of car. This is also known as car fractional ownership or an informal car club. Whenever you would like to share ownership and use of a car with another party for leisure or business use. Perhaps you race the car in your spare time, or perhaps you have a hire business for weddings, or perhaps another arrangement. Whatever your purpose, this agreement will suit. We sell two version of this document. This document has been drawn for two parties. Us e the other version if there are more than two parties (that is, more than two couples, two families, two individuals or so on) Car share agreement: three or more owners. First, you should consider the most suitable structure for your sharing relationship. If you are looking at an arrangement for more than ten people, then it would be better to hold the property in a limited company and buy and sell shares in it. Then ownership of the property itself never changes. No stamp duty is paid once it is bought as the right of occupation can be treated as a licence. However, running a company does cost money, you may not want the formality, expense and greater certainty of a company structure and shareholders agreement in which case an agreement like one of these is perfect. How the law sees it: Even if ownership of your car is registered in a company, those company documents will not record the shares in which the car is held. So If you own 60% and I own 40% we have to record that in some other document. If we do not do so, “the Law” will assume we own in the shares in which we contributed to the purchase price. These Net Lawman agreements specifically record the shares. They also record shares which may be owned by someone who is not a registered owner. This is called a beneficial interest or fractional ownership. Written in plain English with explanatory notes. Other legal provisions to protect your interests.